Your package should contain four overlays of the form you ordered. If you are using the demo version, see the additional installation notes for information on printing demo stamps using the enclosed pdf files. FitalyStamps are printed in five colors on a polyester film and are overlaminated with a 1-mil polyester to protect the print from scratches. They are undercoated with a removable adhesive, which allows them to be removed without damaging the glass surface of the Palm handheld device. On the other hand, removal of a FitalyStamp must be done very slowly to avoid wrinkles in the overlaminate. FitalyStamps are delivered on a transparent plastic backing. To install a FitalyStamp, remove it from the backing and place it back half-way on the backing so that part of the adhesive is exposed and your fingers can hold the backing. Then align the FitalyStamp on the surface of the Palm handheld. Make sure that the top black line is horizontal. Try to align the left border of the green side bar on the leftmost pixel of the screen, the right border of the right panel on the rightmost pixel. Finally, apply the FitalyStamp and slowly remove the backing. If you need to remove a FitalyStamp, use a piece of laser printer transparency film to lift a corner. Then remove the rest very slowly. Between the application screen and the silkscreen area is a 4-pixel-high unused area. FitalyStamp may cover all or part of the unused area. To Install FitalyStamp, run the installer program FitalyStamp3.exe. The installation creates a FitalyStamp3 folder on your desktop computer, with documentation files as well as copies of the files to be installed on your Palm handheld. Running Version 3 of FitalyStamp on a device with Palm OS3 or OS4 requires the presence of an Extension Manager such as X-Master, HackMaster, or TealMaster. The installer offers X-Master as an installation option, which you should select if you do not already have an Extension Manager on your Palm handheld. For a Palm OS5 installation, X-Master should not be installed. The installation of FitalyStamp adds FitalyLetris to the FitalyStamp3 folder. FitalyLetris is both a word game and a training tool for fast text-entry with Fitaly or FitalyStamp. FitalyLetris lets you practice the 400 most frequent English words as they are falling like the pieces of a tetris game. It helps FitalyStamp users develop a visual memory of these most common words on the Fitaly keyboard layout. If you choose to install FitalyLetris, the optional files FitalyLetris.prc and FitalyLetrisDB.pdb will be installed. For a Palm OS3 or OS4 installation, go to X-Master to enable FitalyStamp. For a Palm OS5 installation, enable FitalyStamp from the FitalyStamp installer icon in the Applications Launcher. Tap on the information key �to open the information menu. Tap on FitalyStamp at the intersection of the t a n e keys. You can now start using FitalyStamp. For example, press the MemoPad button, open a new memo, and start typing on the Fitaly keyboard. To Install FitalyStamp, unzip the zip archive FitalyStamp3.zip. This creates a FitalyStamp3 folder on your desktop computer, with documentation files as well as copies of the files to be installed on your Palm handheld. Then use the Palm Install tool to install the files needed for the Palm OS version used by your Palm handheld. Finally, after HotSync, enable FitalyStamp and perform the Adjust Position procedure, as in the case of the Windows installation. Note that for upgrading, you may safely overwrite the companion program FitalySetup without losing registration information, Application Bar settings, and your user-defined slides. On the other hand, the List of Most Recently Used applications is reset when you upgrade. If you used version 2 of FitalyStamp, you can also delete the file FSStatus.prc, which is no longer used in version 3. This first step is essential since going to the second step (deleting) without first disabling can leave the Palm handheld in an unstable state. On Palm OS3 and OS4 installations, disabling is done from X-Master (or whatever extension manager you have). 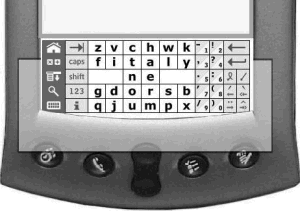 On Palm OS5 installations, disabling is done from the FitalyStamp icon in the Applications Launcher. If you are in doubt, another way of making sure that FitalyStamp is disabled is to do a soft reset (the simple reset that is performed with a paper-clip or with a pen on the back of the Palm handheld). To remove FitalyStamp completely from a Palm handheld, you also need to uninstall FitalySetup.prc, as well as the two databases used for the Application Bar and for custom slides: FitalyAppBarDB and FitalyCustomSlidesDB. Read the attached User's Manual for a description of what you can do with FitalyStamp. This is the place where all usage options are described. The use of FitalyStamp is subject to a License Agreement which applies to registered versions as well as to demo versions of the software.